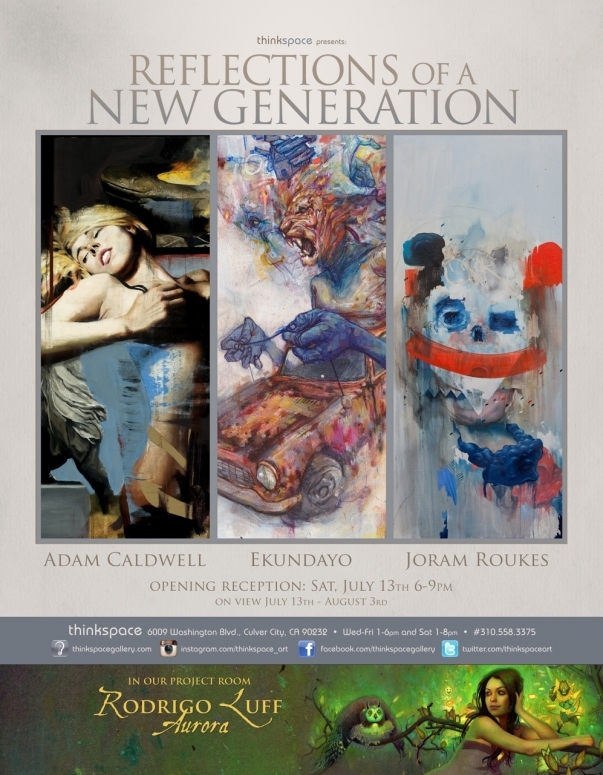 Thinkspace is pleased to present Reflections of a New Generation, featuring new work by Ekundayo, Joram Roukes, and Adam Caldwell. These three distinct artists are unified by a painterly approach to their subject matter and by a tendency towards the surreal. Each works from a unique set of influences and introjects a personal dimension into that of the cultural. Gleaning inspiration from subculture, personal experience, and art history, each has developed a style entirely their own that speaks to a complex locus of coexisting cultural sensibilities. While their work remains graphic and representational, their painterly execution tends towards the expressionistic and the emotive. Each artist’s contribution speaks powerfully to the potential of the new contemporary movement to explore the conflicted accretions of our contemporaneity. Ekundayo is a Los Angeles based artist, originally from Hawaii. The artist’s mixed media work harnesses the visual power of the subconscious through hyperbole and juxtaposition. Owing to his mastery of a surreal grotesque and his early beginnings as a graffiti artist, Ekundayo’s work is monumental and larger than life. The artist’s intuitive recombinations are uncanny and haunting, and betray an understanding of life’s most aberrant and disturbing dimensions. Ekundayo channels the sordid and the abject, but mobilizes the imaginary to attenuate its ravages through fantasy. The artist combines the human with the animal to explore a conflicted interconnectedness, and creates imagery that is allegorical and even mythological at times. Much like an idyllic nightmare, beauty exists with deformity in its midsts. Ekundayo combines the monstrous and the teratological with the beautiful and the redemptive, to convey a profound empathy for the duality of the human condition. Joram Roukes is a painter based in the Netherlands, and a recent addition to the Thinkspace roster. His works delve into the inherent contradictions of Western culture with seething wit and abrupt adjacency. His works are painterly recombinations of daily imagery wielded into a Frankensteinian grotesque that is at once expressionistic and representational; familiar and yet dissonant. His composites are at times violent and jarring, even abject and intensely surreal, as he combines the human with the animal and the inanimate to the point of abstraction. In Roukes’ work, the representational is delivered with the expressionistic force of the abstract expressionists and the graphic precision of the illustrator. Interested in the fallacies of consumer culture, Roukes draws from daily life to seek out poetic discord from the familiarity of the mundane. Adam Caldwell is a Bay area painter whose work explores the intersection of the psychological and the cultural. Taking stylistic elements from abstract expressionism and classical figuration, and combining them with the pop cultural and the illustrative, Caldwell amalgamates distinct and seemingly adverse vocabularies to invoke contemporary conflicts. With an interest in the thematic exploration of self and other, present and past, identity and gender, the artist explores the polarities of the colonized self with a social and political conscience. Caldwell’s work unfolds like a surreal psychological tableau, presenting a simultaneity of antagonisms and unresolved impulses: life set against death, the serious in concert with the absurd, the beautiful coexisting alongside the abject. These juxtapositions of violent classicism and seductive destruction challenge the feigned simplicity of our cultural paradigms.